For four years, I have been awaiting the English translation of The Drops of God, a Japanese manga (essentially a comic book) about wine. I first mentioned this book on my blog back in December 2007, in an article, A Comic Book Selling Wine. Since then, I have posted a few more times about this book, continuing to eagerly await the time when I could read this intriguing manga. The wait is over and The Drops of God: Volume 1 is now available, in English, in bookstores everywhere. I received a review copy of the book, and quickly devoured it, wasting no time to delve into its contents. 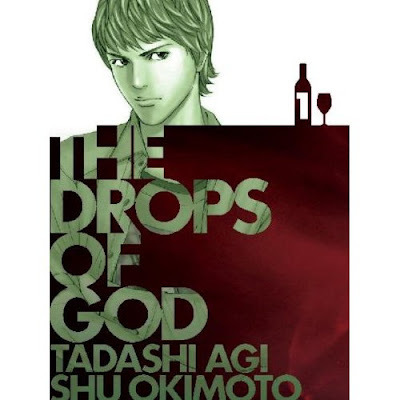 The Drops of God: Volume 1 ($14.95) is a trade paperback, about the size of a usual paperback manga, of 432 pages. Like a traditional manga, the book is read from back to front, which is a minor adjustment if you are not a regular manga reader and used to this format. It contains 18 issues of the original manga and I suspect subsequent volumes will contain a similar amount. The current schedule is for Volume 2 to be released on December 13, 2011 and Volume 3 on March 12, 2012. At this rate, we might expect the release of 3-4 volumes per year. The manga series began weekly publication in Japan in November 2004, and it is still ongoing, so it will be many years before all of the issues will be translated and published in English. In Japan, the manga will likely continue for at least a few more years, if not longer. At the current rate, three English volumes will constitute about a year of the weekly Japanese issues. The plot centers on the will of a recently deceased wine critic, which sets into motion an intricate wine competition between two people to determine who will acquire the estate of the wine critic, including his valuable wine collection. It is a grand epic, which both informs and entertains, and has proven to be very influential. The Japanese have bought large quantities of many of the wines referenced in the manga. I found this first volume to be fascinating and intriguing, an excellent start to the series and I eagerly await the release of the next volume. Let me provide a bit more detail on the plot. Yutaka Kanzaki was a world famous wine critic, considered a peer to Robert Parker, and died at age 67 from pancreatic cancer. He possessed a wine collection thought to be worth about 2 billion yen, which was approximately $20 million US dollars in 2004. Yutaka's deep passion for wine was evident in that he even drank on his deathbed, a 1959 Richebourg Grand Cru produced by the legendary Henri Jayer. Today in the U.S., that wine sells for over $7000 per bottle. Yutaka's estranged son, and apparently only living relative, is Shizuku Kanzaki. Shizuku begins the series as a beer salesman, resentful of how his father raised him. Despite his father's professional fame in the world of wine, Shizuku refers to it as his father's "wine hobby." As he grew up, his father had him sniff leather belts for an hour, lick knives, snack on weird nuts, read poems, look at paintings, listen to music, and much more. This was all in the course of learning about wine yet as the series begins, Shizuku has still never tasted any wine. Shizuku grew tired of all of the training, and chose to enter into the world of beer instead. He was unaware of his father's illness as his father chose not to tell him. In addition, Shizuku was surprised to learn that a week before his father's death, his father adopted Issei Tomine, a famous wine critic. Shizuku and Issei are set up as competitors, each trying to win Yutaka's estate. The will describes "12 great wines" as well as a "legendary wine called 'the Drops of God' that stands above all of them." Within 1 year, each competitor must identify the name of the chosen wines, as well as their vintages. Issei did not really care about Yutaka and simply wants to claim his vast wine collection, which angers Shizuku. The first volume does not cover the identity of the first wine, though Shizuku and Issei do engage in a blind tasting contest over who will get to live in Yutaka's home. In Japan, the manga series has so far identified 8 of the 13 wines, and the competitors are tied. I suspect there will be a tie until the identification of the final wine, the legendary Drops of God. A number of other interesting characters are introduced in the first volume, such as: Miyabi Shinohara, an apprentice sommelier at a French restaurant who becomes an ally and friend to Shizuku (will she become a love interest for Shizuku? ); Shiro Fujieda, a bar owner and Miyabi's teacher who also becomes a partial mentor to Shizuku; Robert Doi, an old friend of Yutaka who also seems to be homeless; and Sara Tomine, a supermodel and Issei's sister (or will she become a love interest for Shizuku?). The manga is educational, covering a number of wine topics such as the basics of decanting, vintage differences, and terroir and I am sure future volumes will cover other diverse wine topics. This is a fun format to learn, and the language is easy enough for everyone to understand. Though there are pretentious characters in the book, it is clear the authors' sympathies are not with those characters. Other characters present a better view of wine, with sentiments such as "But wine is originally meant to be popped open and enjoyed with friends over a tasty meal" and "Price isn't everything." Though the first volume is very Franco-centric in its wine choices, especially devoting much attention to Burgundy, it also touch on wines from Italy and California such as the Rosso Miani and 2000 Opus One. Future volumes will cover wines from other countries as well, though France seems that it will always be the most dominant wine region. We learn much through Shizuku's own education and exploration, who expresses his wine reviews in more unique ways. The first wine he ever tastes is the 2001 Chateau Mont-Perat, which impresses him and that he compares, in detail, to the music of the rock band Queen. Others in the volume review wines in a similar manner. For example, Issei compares the 1982 Chateau Mouton Rothschild to a painting, The Angelus, by Jean-Francois Millet. How often do U.S. writers describe wines in such a manner? Well, I think it is rather rare. When they use language to describe wine, it can also be poetic. A woman shares a bottle of 1999 Henry Jayer Vosne-Romanee Cros-Parantoux with a man because she feels it expresses the feeling, "I want to be with you forever." Issei feels that a Rosso Miani (an Italian wine with no vintage given) reminds him of Salome, an opera, and he states: "A demonic darkness resides in this wine" and "Indeed--this wine is sensuality itself. A blood-scented sensuality born of decadence." Besides the great competition at the heart of this series, there are a number of other smaller contests nd challenges. These provide occasions to educate and entertain, and progress the knowledge of Shizuku. The outcomes of these challenges can surprise, and it is far from a given that Shizuku will prevail every time. These remind me of the numerous challenges from the Oishinbo manga series, which are about food and drink. The final challenge in the first volume, a contest pitting French wines against Italian wines is not completed, leaving you with a minor cliffhanger. This manga raises many thoughts and questions in my mind. Why isn't there a good American wine comic? How popular will this manga be in the U.S.? What can the wine reviews in this manga teach us about writing our own reviews? What can this manga teach us about wine writing in general? What is the best way to educate consumers about wine? Will this manga influence American consumers like it has in Japan? If not, why not? Are American wine lovers ready for a wine comic, or will they view it, wrongly, as a childish pastime? Would this manga make an interesting television show? Can a wine television show be exciting? American comics primarily center on superheroes, and offbeat topics like food and wine are very rare, if they exist at all. Despite the advent of more adult graphic novels, comics are still primarily seen as more for children or geeks. That is not the case in Japan, where manga are pervasive and many adults read them without any stigma. In Japan, approximately 500,000 people each week read The Drops of God, and you will never see such popularity here in the U.S. It is a significant cultural difference, and too many Americans still look at comics as not worthy of their attention. In addition, even if wine lovers might be intrigued to read this book, they would be unlikely to peruse the manga shelves for a wine book. It would be better if bookstores chose to shelve at least a few copies of The Drops of God in the wine section. The Drops of God could help to reduce the intimidation level that many U.S. consumers feel toward wine. It presents some complex wine topics in an easy to understand manner, without talking down to the consumer. Yes, it may be simple at times but it also makes wine education fun. Combining education and entertainment is a great way to interest people in any topic. In Japan, this manga has led to numerous wine sales though that is unlikely to happen in the U.S. First, the comics are old, the issues within the first volume being published in 2004 and 2005, so the wines mentioned probably won't be readily available, and even if they are, might be quite expensive. Some people might be interested in checking out newer vintages of some of these wines but I don't foresee any great rush to buy. But, it would be interesting to see a U.S. publisher create their own wine comic, showcasing recent wines and see how the American public reacts. There is much more I could say about The Drops of God, more questions to address, and I may do so in the near future. I urge all wine lovers to take a look, with an open mind, at The Drops of God. Give it a chance and you might be surprised at how much you enjoy it. Great to hear it translated well - sometimes foreign cultural phenomenons don't always go ovwe well here. excellent, a wine friend clued me into this last year. It's time to get my hands on this one.